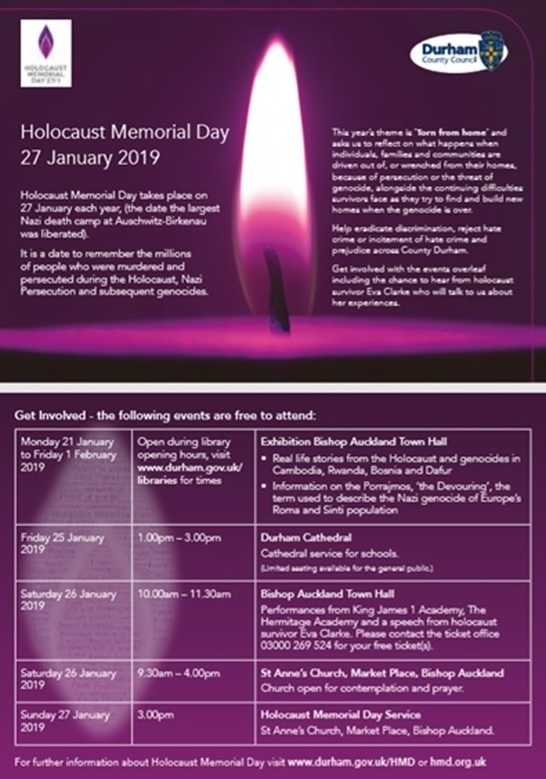 Holocaust Memorial Day (HMD) is a time to remember the millions of people murdered during the Holocaust, under Nazi Persecution and in the genocides which followed in Cambodia, Rwanda, Bosnia, Darfur and elsewhere. The aims of HMD are laid out in the statement of commitment. It was created on 27 January 2000, when representatives from 46 governments around the world met in Stockholm to discuss Holocaust education, remembrance and research. At the end of this meeting, all attendees signed a declaration committing to preserving the memory of those who have been murdered in the Holocaust. Holocaust Memorial Day is a time when we seek to learn the lessons of the past and recognise that genocide does not just take place on its own - it’s a steady process which can begin if discrimination, racism and hatred are not checked and prevented. We are fortunate here in the UK, as we are not at immediate risk of genocide. However, discrimination has not ended, nor has the use of the language of hatred or exclusion. There is still much to be done to create a safer future; and HMD is an opportunity to start this process. Each year thousands of activities take place for HMD, bringing people from all backgrounds together to learn lessons from the past in creative, reflective and inspiring ways. From schools to libraries, workplaces to local authorities, HMD activities offer a real opportunity to honour the experiences of people affected by the Holocaust and genocide, and challenge ourselves to work for a safer, better future. ‘Home’ usually means a place of safety, comfort and security. The theme ‘torn from home’ encourages everyone to reflect on how the enforced loss of a safe place to call ‘home’ is part of the trauma faced by someone experiencing persecution and genocide. We are being encouraged to reflect on what happens when individuals, families and communities are driven out of, or wrenched from their homes, because of persecution or the threat of genocide, alongside the continuing difficulties survivors face as they try to find and build new homes when the genocide is over. To find out more about Holocaust Memorial Day, please click here. Various events (that are free to attend) will be taking place across County Durham. This includes the opportunity to hear from holocaust survivor, Eva Clarke. The Holocaust Educational Trust is pleased to announce that Holocaust survivor Harry Spiro BEM and Robert Rinder will be in conversation live on Thursday, 24 January at 10am in their special webcast to mark Holocaust Memorial Day. Harry survived the Piotrków ghetto (the first ghetto created by the Nazis), Buchenwald concentration camp and a death march to Terezín, coming to Britain in 1945 as part of ‘The Boys’ alongside Robert Rinder’s grandfather. To know more about this event and to register, please click here. Additionally, in the lead up to Holocaust Memorial Day, the Holocaust Educational Trust will be engaging on social media about events taking place and individual stories being shared. Be sure to use #HMD2019 and to tag the Holocaust Educational Trust @HolocaustUK.